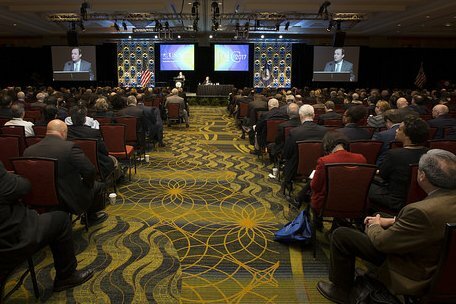 Nuclear Safety Culture (NSC) was assigned one technical session at the 2017 NRC Regulatory Information Conference (RIC). The topic was maintaining a strong NSC during plant decommissioning. This post reviews the session presentations and provides our perspective on the topic. The presenter discussed the agency’s expectations that the requirements of the SC Policy Statement will continue to be met during decommissioning, recognizing that plant old-timers may experience issues with trust, commitment and morale while newcomers, often contractors, will need to be trained and managed to meet NSC standards going forward. The presentation was on-target but contained no new information or insights. This presentation covered the IAEA documents that discuss NSC, viz., the General Safety Requirement “Leadership and Management for Safety,” and the Safety Guides “Application of the Management System for Facilities and Activities,” which covers NSC characteristics, and “The Management System for Nuclear Installations,” which covers NSC assessments, plus supporting IAEA Safety Reports and Technical Documents. There was one slide covering decommissioning issues, none of which was new. The slides were dense with turgid text; this presentation must have been excruciating to sit through. The best part was IAEA did not attempt to add any value through some new approach or analysis, which always manages to muck up the delivery of any potentially useful information. The Kewaunee plant was shut down on May 7, 2013. The shutdown announcement on Oct. 22, 2012 was traumatic for the staff and they went through several stages of grieving. Management has worked to maintain transparency and an effective corrective action program, and retain people who can accept changing conditions. It is a challenge for management to maintain a strong NSC as the plant transitions to long-term SAFSTOR. It’s not surprising that Kewaunee is making the best of what is undoubtedly an unhappy situation for many of those involved. The owner, Dominion Resources, has a good reputation in NSC space. This plant was shut down on Dec. 29, 2014. The site continued applying its process to monitor for NSC issues but some concerns still arose (problems in radiation practices, decline in industrial safety performance) that indicated an erosion in standards. Corrective actions were developed and implemented. A Site Review Committee provides oversight of NSC. The going appears a little rougher at Vermont Yankee than Kewaunee. This is not a surprise given both the plant and its owner (Entergy) have had challenges in maintaining a strong NSC. The session topic reflects a natural life cycle: industrial facilities are built, operate and then close down. But that doesn’t mean it’s painless to manage through the phase changes. In an operating plant, complacency is a major threat. Complacency opens the door to normalization of deviation and other gremlins that move performance toward the edge of the envelope. In the decommissioning phase, we believe loss of fear is a major threat. Loss of fear of dramatic, even catastrophic radiological consequences (because the fuel has been off-loaded and the plant will never operate again) can lead to losing focus, lack of attention to procedural details, short cuts and other behaviors that can have significant negative consequences such as industrial accidents or mishandling of radioactive materials. In a “Will the last person out please turn off the lights” environment, maintaining everyone’s focus on safety is challenging for people who operated the plant, often spending a large part of their careers there. The lack of local history is a major reason to transfer work to specialty decommissioning contractors as quickly as possible. In 2016, NSC didn’t merit a technical session at the RIC; it was relegated to a tabletop presentation. As the industry shrinks, we hope NSC doesn’t get downgraded to a wall poster. * D. Sieracki, “Safety Culture and Decommissioning,” 2017 RIC (Mar. 15, 2017). ** A. Orrell, “Safety Culture and the IAEA International Perspectives,” 2017 RIC (Mar. 15, 2017). *** S. Yeun, “Maintaining a Strong Safety Culture after Shutdown,” 2017 RIC (Mar. 15, 2017). **** C. Chappell, “Safety Culture in Decommissioning: Vermont Yankee Experience,” 2017 RIC (Mar. 15, 2017). I admit it. The title is a cheap April Fools trick to draw new, perhaps less conventional, visitors to Safetymatters. The only thing you’ll see here is the naked truth about nuclear safety culture (NSC), which we have been preaching about for years. We’ve repeatedly listed the ingredients for a strong NSC: decision-making that recognizes goal conflicts and establishes clear, consistent safety priorities; an effective corrective action program; a mental model of organizational functioning that considers interrelationships and feedback loops among key variables; a compensation plan that rewards safety performance; and leadership that walks the talk on NSC. We’ve also said that, absent constant maintenance, NSC will invariably decay over time because of complacency and system dynamics. Complacency leads to hubris (“It can’t happen here”) and opens the door for the drift toward failure that occurs with normalization of deviance and group think. System dynamics include constant environmental adaptations, goal conflicts, shifting priorities, management incentives tilted toward production and cost achievements, and changing levels of intra-organizational trust. NSC in practice appears to have approached an asymptote to the ideal. Problems still occur; currently Entergy, TVA and AREVA are in the hot seat. We have to ask: Is the industry’s steady-state NSC a low-intensity war of Whac-a-Mole? You be the judge.